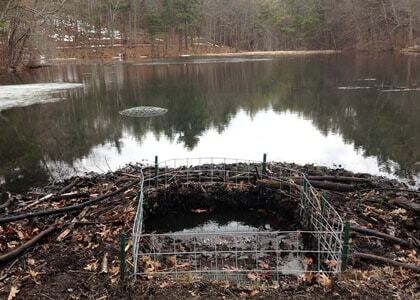 We have the information, products and services to manage Beaver Ponds and work with nature. Comprehensive Beaver Management plans are important planning tools for towns, railroads, utilities and other businesses with large land management responsibilities. Road culverts are the most common sites for problematic beaver damming. A blocked road culvert can quickly cause dangerous and expensive road safety issues. 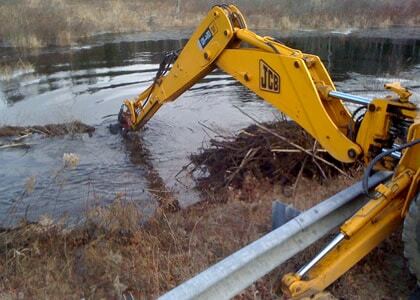 Nearly every road culvert can be protected from beavers with use of custom pipe and fence kits. Properly designed and constructed culvert protective devices have proven to be extremely effective in eliminating culvert damming by beavers. Our flow devices have a 98% success rate protecting culverts despite the presence of beavers. Beaver Solutions™ Specializes in Resolving Human/Beaver Conflicts. Our highly successful flow devices usually offer the most cost-effective and long-lasting solution to beaver-related flooding problems. We combine an understanding of beaver behavior and abilities with the latest advances in design to create cost-effective, low maintenance flow devices that prevent damaging flooding. We also offer licensed beaver removal in MA. If you are located outside of our southern New England service area we highly recommend you contact the Beaver Institute™. Road culverts are the most common sites for problematic beaver damming. A blocked road culvert can quickly cause dangerous and expensive road safety issues. Fortunately nearly every road culvert can be protected from beavers in a cost-effective, long-term, environmentally friendly and humane manner. Beavers build dams for protection from predators, but sometimes these dams can cause flooding issues for people. 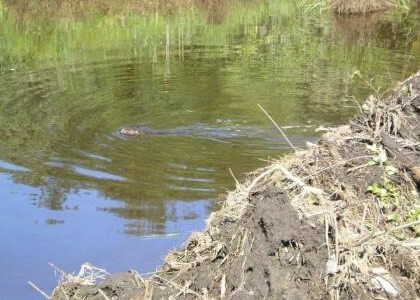 When this occurs the size of the beaver pond can often be controlled to prevent damage to human property with a well-designed Flexible Pond Leveler pipe system. Structures designed to drain waterare common sites for problematic beaver damming. A blocked drainage structure can quickly cause dangerous and expensive flooding issues. Fortunately nearly every man-made drain structure can be protected from beavers in a cost-effective, long-term, environmentally friendly and humane manner.